(Nanowerk News) A recent statistical study carried out by researchers from Universidad Politécnica de Madrid and Universidad de Valencia has revealed that the mass of Exoplanets between 1 and 100 times the mass of the Earth have a surface gravity surprisingly similar to the terrestrial gravity. The acceleration that a body experiences on the surface of a planet, the gravity on surface, depends on the mass M and radius R according to a simple formula of Newton a=GM/R2, in which G denotes the universal gravitation. Therefore we expect that planets with masses and sizes different from Earth shed very different gravity values in surface. In fact, this occurs, for instance, to our Moon whose surface gravity is about g/6, this explains the particular way of walking of astronauts on the Moon that we see in documentaries. If movie scripts faithful to the laws of physics, Should not we see similar effects in many fictional planets, like Tatooine or Alderaan of Star Wars? Surprisingly, it does not occur so. A recent study published in the Astrobiology Journal ("Walking on Exoplanets: Is Star Wars Right?") has found that, despite showing ostensible differences in mass and size, a considerable fraction of the extrasolar planets discovered so far has a surface gravity very similar to the Earth gravity. The article reveals this interesting property of the gravity that the models of planet formation do not explain. 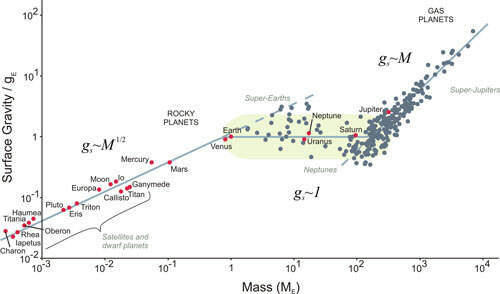 In order to carry out this study, researchers used the exoplanets.org database and estimated the surface gravity of those exoplanets whose mass and radius are already known (about 1,200 exoplanets from the 3,500 detected exoplanets). 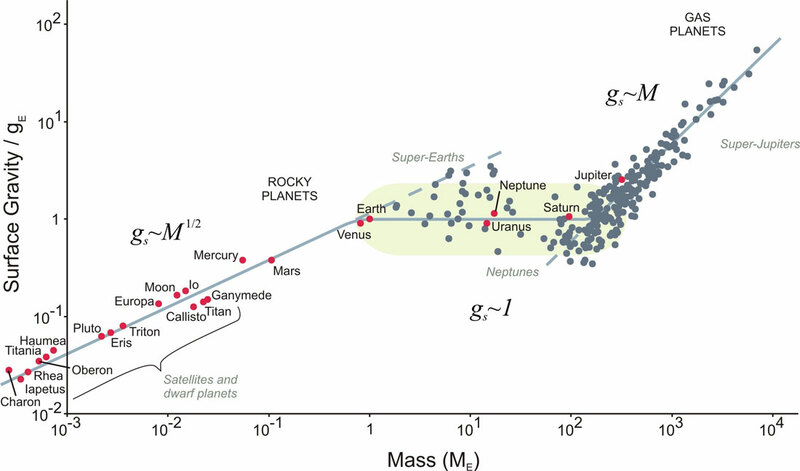 If the planets masses (units of mass earth) were represented facing their surface gravity (in units of terrestrial gravity) on double log–log plot, we would observe three scaling regions clearly distinguished. Firstly, the surface gravity of the small bodies in the Solar System and rocky planets smaller than Venus grows with the square root of the mass. Secondly, in the case of gaseous giant exoplanets, the surface gravity linearly grows with the mass. And surprisingly, in the transition zone (between 1 and 100 land masses), we find some sort of plateau that shows a constant surface gravity roughly similar to that of Earth. The results revealed by Ballesteros and Luque are confirmed in our own planet system: although Uranus, Neptune and Saturn are, respectively, 14, 17 and 95 times more massive than Earth, their surface gravities barely vary between 0.9g and 1.1g. According to the authors, the current models of planet formation fail to predict this constant law, but they do predict the power laws whose exponent changes smoothly when passing from the completely rocky planets to the gas giants.